coqui, left, and the Eleutherodactylus planirostris, or greenhouse frog. HILO -- Screeching alien frogs from the Caribbean -- as many as 10,000 per acre -- are shattering the night on the Big Island and Maui. They also have a toehold on Oahu and Kauai. They could lower property values, damage nursery exports, and wreck native forests. The amphibians are no more than two inches long, but when a group of them repeats their piercing calls all night, it can be severely aggravating. Linda Stevens has them in her yard in Leilani Estates, south of Hilo. "Either you get used to it or you go insane," she said. U.S. Department of Agriculture biologist Earl Campbell is working at a field station in Hilo to control them. "On a good night, it's just deafening," he said. The offenders are two frogs from the same genus. The really noisy Eleutherodactylus coqui is up to 2 inches long and hails from Puerto Rico. It puts out ear-splitting, 100-decibel squeaks -- about as loud as a table saw cutting wood. 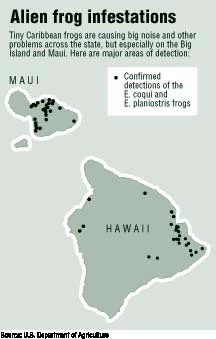 The frogs are established at about 40 sites on the Big Island, 30 on Maui, three on Oahu, and one on Kauai, said biologist Fred Kraus of the state Division of Forestry and Wildlife. The smaller Eleutherodactylus planirostris from Cuba, the Bahamas, and Cayman Islands is up to 1-1/2 inches long. It's quieter, but also causes complaints. The frogs' long-winded first name refers to their free, unwebbed fingers. The second name of E. coqui, the species of major concern, refers to the sound it makes, something like co-KEEE. To hear it on the Web, go to http://www.hear.org/frogs. In Hawaii, it was spread by plant nurseries. The frogs especially like to sit among the leaves of bromeliads and crawl into drainage holes in nursery pots. One grower on Maui spent thousands of dollars bulldozing bromeliads, trying to wipe out the frogs, Kraus said. How loud could they be? Audio from HEAR.org Web site. But a Big Island grower sells potted plants knowing frogs are in them. "He is totally unconcerned. He has no compunction," said Kraus. He declined to identify the Maui or the Big Island growers. But nurseries are starting to see the threat. Frogs climbing onto sterile trays could carry nematode (worm) eggs, although that has not been demonstrated, Kraus said. California, Japan, and other export destinations could refuse plant shipments if they suspected or found frogs in them, he said. 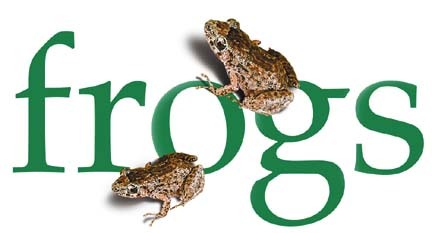 Some homeowners, thinking the frogs are cute, deliberately take them home, said Campbell. A state law specifically prohibits transporting frogs to new areas, but these people think it would nice to have frogs in their home pond, he said. The fact is, these frogs don't have a tadpole stage and don't use ponds. E. coqui hides on the ground during the day, then climbs trees at night. E. planirostris sticks to the ground. Steve Nottingham of Kapoho said he knows guys who are mad at a girlfriend, so they throw frogs in the girlfriend's yard. "If you think your neighbor's dogs are a problem, wait 'til you hear these things," he said. "I sprayed soap, bleach, gasoline, kerosene, oil, weed killer, pesticides. Nothing phases these things," he said. Some resorts on Maui got worried when the frogs started making a racket there. A coalition of private businesses and government agencies got a $60,000 grant, and Campbell and two assistants started in December to research ways to control the frogs. They discovered caffeine, concentrated about seven times the strength of a cup of coffee, knocks them dead in the laboratory. "It probably causes a heart attack. We don't know," Kraus said. Field tests -- spraying caffeine in the wild -- will start soon. This is the point at which some people remember that some other species of frogs around the world are dying off for unknown reasons. Eleutherodactylus is in no such danger, Campbell said. "These frogs are really tough." Within this one genus are more species than any other backboned animals on earth, he said. These are "tramp species," traveling the world with humans, he said. "These things are similar to rats." And Hawaiian forests are wide open to them. They eat about 46,000 food items per acre per night -- mostly insects but also snails and other frogs. Getting rid of so many bugs might sound good, but that's food that might otherwise go into the mouths of native birds in a system which is currently in balance. The frogs are getting into native forests on the Big Island, in upland Volcano and lowland Leilani Estates. Among the birdlife in the native forest on her one-acre lot, Leilani resident Stevens has seen amakihi, apapane, and possibly iiwi. "Our main concern is our native birds," she said. These two frogs were accidentally introduced to the Big Island via infested horticultural plants from the Caribbean. During the past 10 years, their numbers have ballooned; they have also infested Maui, with sightings on Oahu and Kauai. The coqui (Eleutherodactylus coqui) ranges in color from light to dark brown on the back, with a white or yellowish belly and (occasionally) red flanks. The greenhouse frog (Eleutherodactylus planirostris) is small and dark with black and brown markings. Both frogs produce loud calls which can disturb people's sleep. Both are active at night, and are found on vegetation (coqui) or on the ground (greenhouse frog). During the day they favor moist protected areas, often hiding in the leaf axils of common ornamentals like dracaena, ginger and elephant ear. 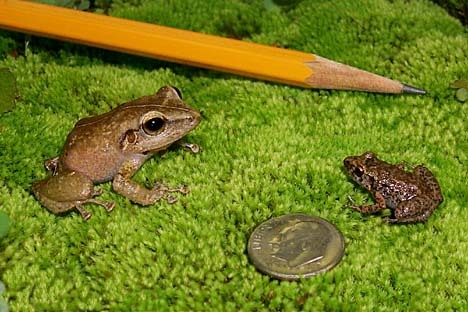 Both have no tadpoles; tiny frogs hatch directly from eggs laid on foliage. They are terrestrial and not usually found in ponds or standing water.